named personages lived and quarreled; good or bad, handsome or ugly, rich or poor, they are all equal now." Lindëfirion (”Lay of the Dead”) is a Finnish roleplaying world based on a unique (and non-canon) vision of J.R.R. 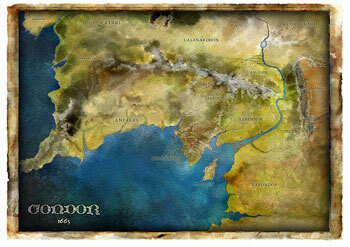 Tolkien's Middle-earth, created by Sampsa Rydman. The tale set in the waning years of the Kingdom of Gondor. It is concerned with Death as a part of the nature of Man, and hope without guarantees; combining joyous comedy and romance with tragedy of politics and philosophy. This Wiki, powered by Wikka, is intended for the benefit of my gaming group. Buy maps and support Lindëfirion! "Númenorin ihmiset asuttivat laajalti Suuren Meren rannat ja merelliset seudut, mutta suurin osa heistä lankesi paheisiin ja tyhmyyksiin. Monet ihastuivat suuresti Pimeyteen ja taikuuteen; jotkut antautuivat kokonaan joutilaisuuteen ja mukavuuteen, ja jotkut taistelivat keskenään kunnes villi-ihmiset kukistivat heidät heidän heikkoutensa tähden."